Deep cleaning services in DC, Maryland, and Virginia have never been so available and affordable. Thanks to Maids Prime professional service, you can start enjoying the benefits of your clean and safe home as soon as you book our deep cleaning services. We, at Maids Prime, can offer you efficient and professional deep cleaning services for your home. Our motto is – clean home, happy home. That is our promise to you. Due to our highly qualified working philosophy, we guarantee complete and thorough services whether you’re our regular client or you need a one-time deep house cleaning. Also, Maids Prime offers you supreme quality deep move in/move out cleaning services. Book deep cleaning services today. Why Do I Need Deep Cleaning Services? 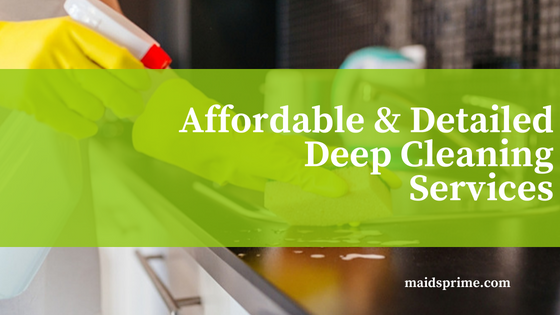 Deep cleaning services by Maids Prime are available, affordable, and time-saving. Once you feel the magic of our deep cleaning services, you will keep coming back to us. It’s easier than you can imagine. Believe it or not, all you need is our contact info! Deep whole house cleaning service is our specialty and we know how to make your home completely clean, safe and pleasant to be in. Thorough full house cleaning includes professional knowledge and help. Maids Prime deep clean specialists can reach all the hidden corners in your house and provide the complete sanitation from the ceilings to the floors. We are particularly proud of our deep cleaning services concerning kitchen and bathroom spaces. These two rooms are the most often used rooms in any home and can be real kingdoms of dirt, mold, and grease. But, the good news is that Maids Prime has extremely effective techniques when it comes to making your kitchen and bathroom perfectly clean and safe. If you live in DC, Maryland, or Virginia, hesitate no more and book cleaning services. After we come and deep clean your home, you will sense and see the difference right away. Our deep cleaning services mean that we will deep clean your bathroom from top to bottom. What will you exactly get? The final result is impressive, believe our word. You get the impeccable and thoroughly clean bathroom, just as if you’ve just created a new one. Maids Prime’s deep cleaning specialists will completely clean all the areas in your bathroom. Yes, they can handle this with great devotion and perfectionism. Our deep cleaning checklist includes the walls, floors, ceiling, mirrors, bathtub, shower, sinks, and all glass areas. Our services also include bathtub deep cleaning as well as the total cleaning of your shower, toilet, sink, door handles, light switches, and all the other small but important elements in your bathroom. Eventually, our professional cleaners will take the complete care of your bathroom by taking out all the unnecessary things (trash, etc.) from your bathroom. Bathroom deep cleaning is the service we provide continually for many years. We always deliver superb results and get 100% satisfaction from our clients. The kitchen is possibly the most favorite and the most used room in your house. There, you make food for your family and friends with lots of love and passion. That’s why your kitchen cabinets deserve the best treatment and thorough cleaning. Maids Prime can take care of your precious kitchen and make it clean and safe for all your culinary challenges. Our kitchen deep cleaning services involve complete and detailed cleaning of your kitchen cabinets, including the drawers and all those tiny, invisible places that get full of tiny specs of dirt fast. Our well-skilled cleaning specialists will make your kitchen fresh looking and shiny. They will wash and clean all your kitchen appliances and gadgets, regardless how big or small they are. 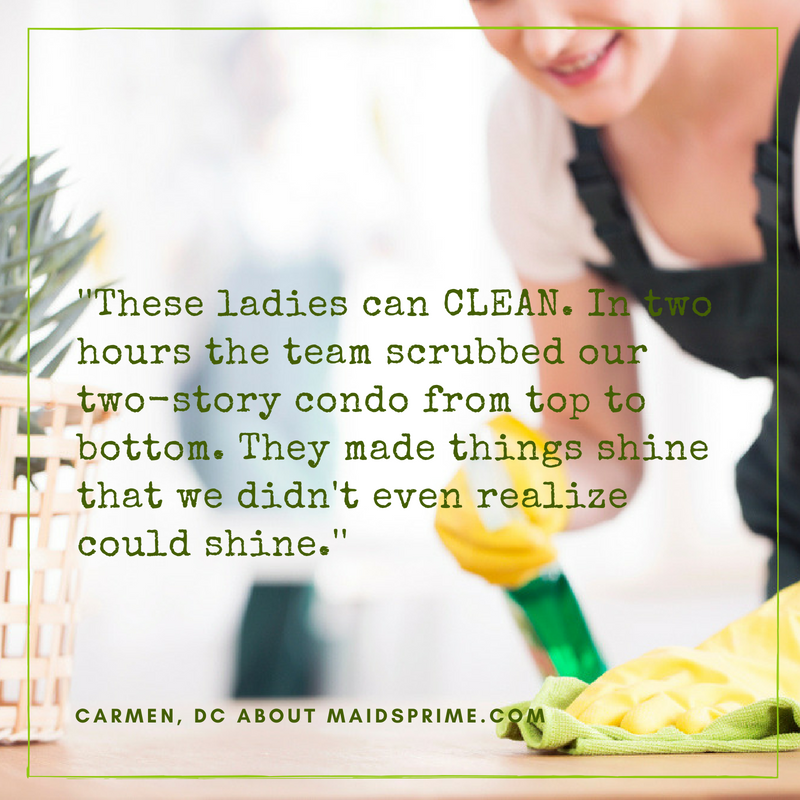 The best part is that Maids Prime can clean the entire kitchen from top to the floor without any mistakes. Kitchen hood cleaning, kitchen sink, kitchen cabinets, stovetops, drawers, oven, refrigerator, freezers, microwave, light switches, all the corners, floor, walls, and ceiling – we won’t miss a spot. We do it like this because we love our job. And our job is to make you satisfied and relaxed. You know what they say. There’s no place like home. And your kitchen is its essential part. As previously marked, Maids Prime offers you full house deep cleaning services. Apart from your kitchen and bathroom deep cleaning, we can make your living room a true oasis where you can spend some time quality time with your loved ones and enjoy your fresh and safe home. We can also take care of your bedrooms the same way and turn them into peaceful and clean sanctuaries for sweet dreams. We at Maids Prime understand your needs and wishes. It’s only natural you want to spare your free time in order to spend it in a more interesting way. On the other hand, you need a regular deep home cleaning. Don’t worry. We are here to help you and provide you with deep home cleaning services. We provide deep cleaning services for both residential and commercial clients. Our services are efficient, highly professional, and affordable. In case you live anywhere in DC, Maryland or Virginia, we are the solution for the cleanliness of your house, apartment, office, or any other type of commercial or residential space. We offer the most professional office and home deep cleaning services in these areas. A wide range of 100% satisfied clients is our best reference. Simply contact us or book cleaning service today, and Maids Prime’s professional team will be there in no time to create the magic of a perfectly clean home.